The stewards' penalty dished out to Hamilton at the Belgian GP is still occupying my thoughts. I have read all the comments (currently at 415) on Keith Collantine's post on the subject, plus countless others on other blogs and websites. And it seems that no one is getting the point, in spite of Alianora's clear explanation of the rule under which the penalty was given. Complicated, isn't it? That is the rule the stewards chose to enforce and that is all we need consider in our debate on the matter. And it is quite clear that Hamilton did indeed depart from the track in his progress through the chicane. That should be the end of the story but the rule is so all-encompassing that, were it to be enforced to the letter, almost every car in the GP would also have to be penalized. Contrary to the assertions of so many commenters, nowhere in the rules does it mention that an advantage gained by an off-track excursion has to be returned, it is never stated that leaving the track and returning without advantage is allowed, it does not say that the driver must wait a corner or two before attempting to pass again. Section 30.3(a) is all we have to go on. So where does this idea that drivers will be forgiven if they return the advantage come from? We have seen so many instances of such an action in the past that it is natural that we assume it is somewhere in the Rulebook. But the truth is that it is a convention, something accepted by the sport without it ever being written anywhere in black and white. The fact that the stewards append their opinion that Hamilton gained an advantage through cutting the chicane is an unnecessary addition if they are using Section 30.3(a) as their justification for the penalty. And that immediately begs the question: So why did they choose to pick on this one instance of an infraction against Section 30.3(a) and none of the many other instances? One can see why there is a widespread feeling that the FIA has a pro-Ferrari bias. But I will come to this question in just a moment. In this instance, it appears that the stewards were not interested in applying the convention of returning the advantage. All the arguments over how much of an advantage should have been returned are wasted, therefore - the stewards have not been there. They seem to be saying that, because Hamilton returned to the track ahead of Raikkonen, an advantage had been gained; there seems no interest in whether the advantage was returned. So they have decided to ignore the convention and impose a penalty purely under the terms of Section 30.3(a), with an attempt to explain why other infractions during the race have not been penalized. Hamilton gained an advantage, others did not, apparently. But this ignores Raikkonen's use of the run-off area around Pouhon to cut the gap to Hamilton and challenge him at the next corner. And it is no argument to say that Raikkonen took himself out of the race later - there are penalties available that could apply in the next race. The Stewards do not act on their own. They react to reports delivered to them by the F1 Race Director. This is Charlie Whiting, a former Brabham F1 mechanic who worked his way up to the position and works out of the same office as Max Mosley in Monte Carlo. In Spa Ferrari very carefully made sure that the media knew that it had not protested the result of the race and that the action was based on a report from Whiting. From the pit wall, we then asked Race Control to confirm that they were comfortable that Lewis had allowed Kimi to repass, and they confirmed twice that they believed that the position had been given back in a manner that was 'OK'. If Race Control had instead expressed any concern regarding Lewis’s actions at that time, we would have instructed Lewis to allow Kimi to repass for a second time. Who is in charge of Race Control? Why, Charlie Whiting, of course (in fact, Ron Dennis said that it was Charlie that he spoke to). This puts the Race Director in a rather unsavory light. First he assures McLaren that the move was okay, then he writes a report to the stewards, asking that they investigate it. In effect, he was ensuring that there was nothing that McLaren could do to put the situation right. If that does not indicate an intention to prevent a McLaren victory, then why would he lie to the team? Indeed, there is some irony in the situation in that it might have been McLaren's inquiry that gave Charlie the idea in the first place. That would be entirely in keeping with Ron's apparent talent for trying to do the right thing and then being blasted for it. But it is speculation, so I will let it pass. The whole thing looks as though the FIA (not necessarily the stewards - they were merely doing their job as instructed by the FIA's Alan Donnelly) will look for ways to penalize McLaren at every opportunity. I know that sounds insane, but what else am I supposed to make of this latest in a long list of strange FIA decisions against the Woking team? As has been said so many times before, no matter how badly written the rules, let us at least have some consistency in their application. To allow Massa to escape with a fine for an offense against a safety rule at one race and then demote the victor at the next race for breaking a sporting rule is just indefensible. I like the tack you have taken on this piece Clive. There is one thing I picked up somewhere yesterday which put an interesting spin on the situation. Max is due to be returned to polite society at Monza and clearly would have been expecting to be harangued by the press about his hobby. That will no longer be the case as the press will be more interested in this penalty. He must also have been anticipating some grief from the fans but since the majority of Monza goers are Ferrari fans he is unlikely to have that happen now. Maybe my cynical side takes over occasionally but from his point of view it would have been very convenient to take advantage of this situation and have Alan Donnelly persuade the stewards to penalise Lewis to take the pressure off Max at Monza with a view to returning to the status quo on appeal weeks later. In effect the results would stand and Max would have an easy ride on his personal life. I would never suggest that is what happened but from his point of view it would be very convenient. wow, that's really one heck of a (really plausible) conspiracy theory, Steven Roy! The amount of time that elapsed before the announcement of the investigation would have allowed for the necessary phone calls to have been made for your theory to have substance, Steven. It also explains why Charlie had so momentous a change of mind during that time. Whether the parties involved could have been that quick-thinking and devious, I don't know, but it is certainly a possibility. And that highlights another thing that is wrong in so many of these stewards' investigations: when they are late in being announced and then take a long time to debate before a decision is made, we are bound to wonder what they are finding so difficult to decide upon. If an offence is obvious enough to warrant an investigation, surely it should be a pretty quick job to review the evidence and reach agreement? Allowing the stewards to drag things out so late and for so long increases the chances of their being influenced by outside forces. It all looks too suspicious in a world where the FIA are already suspected of manipulating the championship and the fans are entitled to demand a full explanation of what goes on in that boardroom when incidents are investigated. I doubt any quick thinking was involved. More likely a word from Max to Donnelly to look out for a situation to capitalise on. I have just had a horrible thought enter my head and I wish it would go away. When Max was having his little problem recently and the notion of Todt taking over was discussed a lot of loud voices objected. What if Donnelly is Plan B? Really great post clive, very nicely written. Ed over at the times reiterated that it was charlie whiting who instigated the stewards' investigation. However according to Alianora, apparently the stewards are entitled to look at anything they want to, irrespective of any report from the race director - they can act with complete independence. I do have to say that the more time I llok at this, and all the evidence that is thrown up, the more it makes my blood boil. And Actually the event that really gets my goat is viewing that Pouhon corner where Kimi uses the runoff, and you see lewis in front of him get right back onto the track, whilst kimi happily uses every single possible foot of high-friction to his advantage to catch up to Lewis for an attack at the very next corner. I find it amazing that they can penalise lewis for the bus stop, but not kimi for that. Just one other question - who is Charlie Whiting actually employed by??? you say he works out of the same office as max in Monaco - but is it FOM?? or FIA or some other entity??? Apparently Charlie Whiting gave the all clear to Ron twice. 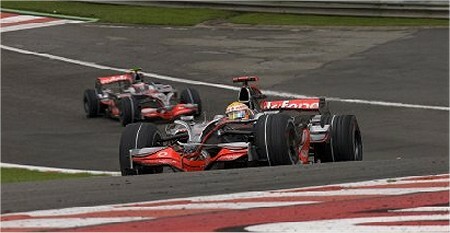 Seems to me McLaren & Lewis have clearly been victimized by the stewards ignorance of Whiting's OK. But what's this about Charlie being the one to instigate the review? Seems awfully strange. Josh: I did mention the three ways an investigation can be started but the evidence so far points at Charlie Whiting being the initiator with his report to the stewards. One presumes that, prior to that, they had no intention of investigating the incident or they would have been busily conferring when Charlie knocked on their door. Charlie is employed by the FIA, not FOM (who stick to counting the beans and devising new ways to squeeze money from us), and he actually performs several functions for the governing body beyond his position as Race Director at GPs (Chief Scrutineer is another of his titles). Don: Yes, McLaren have said they were told twice by Charlie Whiting that everything was fine immediately after the incident. An increasing number of sources maintain that it was Charlie who began the investigation in his capacity as Race Director - Ferrari made a point of mentioning his part when denying that they had anything to do the the investigation. You may draw your own conclusions regarding Charlie's motives and intent in the matter. There is a prior instance of Charlie's integrity seeming suspect in that Nigel Stepney has claimed that he informed the FIA of Ferrari's illegal flexi-floor device early in 2007. That information went to Charlie Whiting as Chief Scrutineer and he did... nothing. We all know what Stepney felt driven to do as a result of the FIA's apparent unconcern over the possibility of Ferrari cheating. Charlie has been a well respected figure in F1 for many years and the teams have relied upon him as one of the most fair and unbiased FIA officials. Stepney's statement came as a shock to me at the time but leaves me rather cynical about Charlie's involvement in the latest travesty of justice. would whiting actually have to knock on the stewards door? i have no idea what race control looks like or is set up. is whiting in the same general area as the stewards? if mclaren spoke to him via phone, is it possible that the conversation was not as private as assumed? could that have jogged the stewards into action? or after hanging up with mclaren could whiting have actually had a second look and thought he better forestall a ferrari protest? the initial report i heard was that an incident involving kimi and an incident involving hamilton was being investigated. i assumed they were also looking at the possiblity of kimi misbehaving. regardless, like i said, i started looking at those rules before alianora posted on her blog and i was mystified. and more so after i read her post. i was convinced there had to be something else in that rule book that i wasn't seeing. i can understand leaving wriggle room in the regs but, honestly- you have to drive on the track? duh! and then i started looking at the regs again. i don't see how any one can apply or not apply any of it with any kind of sanity. if they applied the rules as written by the end of the season those teams would be bankrupt from paying out penalties and that would actually have to be the new scoring system- the team with the fewest penalties wins. Any of your suggested scenarios could have been the case and we should be asking for more information in this regard, if we are ever to regain any confidence in the FIA's ability to administer the sport in a competent and fair manner. But the possibilities do not exonerate Charlie from some double dealing the matter. On the one hand, he is assuring McLaren that everything was fine and above board; on the other, he is writing a report that must be critical of Hamilton since it began the investigation by the stewards. What kind of a report that states that everything is fine and there is no need to investigate an incident starts that very investigation? Indeed, there is no need for Whiting to write a report at all if he feels that nothing untoward happened. The report of the stewards' investigation stated that an incident between Hamilton and Raikkonen was being investigated. We were left wondering which one but, as it turned out, they were looking at Hamilton's part in the Bus Stop chicane incident. Had they been looking at Raikkonen's role in it all, they would have mentioned that he had been found not guilty of any offence. The rules are, as you say, totally inadequate to the task of governing a sport where competitors regularly take to run off areas for one reason or another. That is why the convention developed - to fill the gap left in the regulations and enable racing to continue. Unfortunately, a convention does not have the legal force that the regulations do and, as the stewards have demonstrated, it can be ignored if they feel like it. That, surely, is a situation that cannot be allowed to continue. yeah, i knew you were joking but it started me wondering what the actual race weekend set up is like. and realizing how little anyone ever says about the behind the scenes workings of the sport. i don't think it's sinister or anything just- interesting. that would be a nice feature for f1racing instead of the usual drivel i've been seeing lately. but i agree. if whiting were going to second guess anything he told mclaren, then he should not have said no prob. and it's going to take a whole lotta change and transparency to restore my faith in the fia... since i never really placed much there to begin with. I would say that defining where the cars should race is a bit like defining the event for someone coming into the sport with no previous experience. It is like a legal document beginning by defining the words used within the document - so that there can be no possibility of misunderstanding. That is necessary but must then be expanded into a system of rules to cover those eventualities where the cars do not stay on the track and that is what the FIA regulations fail to do in far too many situations. 1. McLaren have appealed Hamilton's penalty and I truly hope they prevail. Never thought I'd write that but I want Massa's title to be undisputed. 2. Since the stewards have used Section 30.3(a) as the basis of their penalty - during practice and the race, drivers may use only the track - the most likely intention of that rule is that drivers must not take short cuts, i.e. travel less distance than their competitors; that would be unfair. Raikkonen's use of the run-off area near Pouhon did not shorten his lap - it more likely lengthened it - and so requires no penalty. Yes, McLaren have appealed the penalty. It remains to be seen what the outcome of that will be. Like you, I hope the decision is reversed and we can have a championship unsullied by dubious decisions by race stewards. But I cannot agree with you regarding the likely intention of the rule (apart from the fact that it's irrelevant what we think the intent is - the rule is stark and suggests no exceptions). The stewards have indicated why they think the rule should be applied in this instance - the gaining of an advantage - and we are entitled to see it applied in similar circumstances in this and other races, therefore. Kimi gained an advantage by using the Pouhon run-off yet no investigation was begun. End of story. Not so, Clive. The rule drafters' intention is not only relevant but crucial. A rule is created for a reason and the underlying reason must be understood not only to apply the rule properly but in order to criticize it. Certainly the FIA never intended the rule to be used to penalize all competitors that leave the track; that would be ridiculous and the FIA never intended the rule to be ridiculed. So what was intended? A rational intention of the rule would be that no advantage - intentional or unintentional - be obtained by a driver leaving the track. I believe that most would agree that leaving the track by cutting a corner or chicane in order to pass someone violates 30.3(a) and such an understanding has therefore, by long-term usage and generally accepted precedence, attached to this rule. Similarly, by long-term usage and general acceptance, run-off areas have been used as part of the track and no-one, to the best of my knowledge, has ever been penalized for driving on any run-off area during an F1 race. Again, by long-term usage and general acceptance, drivers that gain advantage by cutting a chicane and so passing another car may relinquish that advantage by allowing the passed car to regain its former position and so not incur any penalty. Courts of law depend upon accepted long term usage and precedence, as should, and do, race stewards. Clive: Check out what Pat Symonds has to say about this. Green Flag: Naturally the rule drafters had an intended meaning when they wrote the rule. It is not my fault that they wrote it so badly and failed to then expand upon it so that it ends up applicable to everyone who ventures off the track in a race. You may think your version of what they meant is the only applicable one but it is not so - it is merelt a statement of your opinion and there are many others. Convention does not have equal power in law as written statutes. Since it is not written down anywhere it is always more vague and open to opinion than written law and will always lead eventually to arguments over fine points, as we have seen in the last few days. The reason no one has yet been penalized for using a run-off area on the outside curve as yet is that, until recently, they did not exist. Massa's use of one of these at Fuji last year to win the race was the first instance of such an area being used to advantage, I think. Circuits are still in the process of converting these areas from gravel traps to tarmac and any excursion into them in former years tended to end with the car stuck in the gravel. Don: Thanks for the link - very interesting. Pat is voicing the vast majority of informed viewers' opinions on the matter and it is a pity that it has no relevance to the stewards' decision, as pointed out in my post. The stewards are punishing an excursion off track and are not interested in anything that happened after Hamilton re-joined the track. I thought the statement by Symmonds where he said that they 'have' to beleive the FIA is impartial is very telling, don't you? I have always beleived that the FIA do favour Ferrari, and that they tend to penalise the team who are currently challenging them. Just take a look at Alonso's pass on Heidfeld in Monaco - no penalty. An almost identical one from Kovi was pinged within minutes. Yet when Alonso was challenging Ferrari, well what a difference. Mass dampers, tyre wars and Monza 2006 spring immediately to mind. So currently it is McLarens turn for the FIARRARI special treatment, and if another team becomes the main challenger they will get the spotlight on them. The last 2 years have just been particularly nasty because of the obvious personal issues between S&Max and Ron. And as for Steven Roy's theory, the more I think about it, the more credence I allow it. I had originally thought that this travesty was merely as a result of the FIA wanting Massa to win the championship, but it is infinately possible there were more machiavellian intentions behind it. Peril: Max is deeply entrenched and I can see no way for him to be removed from office. That is why I think that the teams will have to set up a rival series sooner or later. Until then, all we can do is to plug away, pointing out the injustices perpetrated by the FIA and being as fair as we can be in doing so. Becken: I read Mr Thathi's comment this morning and just shrugged. It is the sort of thing we have become accustomed to FIA officials saying in their arrogance and ignorance. Bernie has said much worse over the years. don, thanks also for the link - very interesting. Seemed like a big deal to him that lewis was 7kmh slower, and it seemed perfectly obvious to him that all was required was to give the position back, and also that kimi passed him later on the lap. Clive - apologies for not realising you'd mentioned the various options for investigation by the stewards, and thank you for clearing up the whiting picture. I'm not entirely sure why the need Donnelly there if they've also got whiting - surely that should be whiting's job - or at the very least the guy doing donnelly's job should be trained for it, and have some experience in it. As I've said before, the more I get embroiled in this, the more angry I get. The more I look at the videos, the more I actually think Kimi should have been the one penalised for pushing lewis off at the bus stop. Lewis was actually ahead at the entrance, and it was actually kimi who locked up coming into the first apex, and subsequently pushed lewis off the track - was that a direct result of him locking up?? Anyway, I'm sorry to go on, I just don;t see how it is even vaguely conceivable for them to punish lewis for this when everybody did it. It's beyond insane. Frankly, I'd love it if Ron just said sod it, and left for Nascar. I didn;t realise that the rules didn't actually ever mention either the whole advantage thing, or the whole giving back of the position. The fact that this sport operates with one of the most important rules saying that you're not allowed to run off the track is insane. To be honest - the more i find out about all of this, frankly, the less respect I have for the competitors for EVER operating under these conditions. I just can;t believe they've let it happen, and it is them who've let it happen. That Ron et al can;t outmanouver Bernie and Max is pathetic. Charlie Whiting already has several jobs that he does for the FIA - he is, in fact, their leading technical expert (some would say "only") and is overloaded with responsibilities as a result. To give him the task of advising the stewards would be asking too much, I think. In fact, the FIA did have a permanent steward until recently and he was a respected and knowledgeable part of the stewarding team. When he suddenly departed, whether voluntarily or by persuasion, we do not know, Max brought in his buddy, Alan Donnelly, as a sort of adviser to the stewards. How this was supposed to be a better system than a professional permanent steward, I don't know, especially as Donnelly has known connections to Ferrari. But that doesn't seem to matter to the FIA, where Ferrari board members sit on appeal courts and delegates have strong Ferrari connections. None of the other teams are represented in this way. As for overthrowing the hierarchy, it's been tried but always fails because the teams cannot present a unified front to the governing body. It came close last time, with Ferrari breaking ranks after arranging a hefty annual payment to them from the FIA. Sounds like bribery, doesn't it? I believe a certain Mr Schumacher can la claim to being the first driver to gain a place by using the tarmac run off on the outside of a corner at Hockenheim. I have no doubt Tony Scott-Andrews was pushed. Had he intended to retire from that position it would have been announced at the latest at the last race last year. Instead we had most of the winter believing he would return and then he was gone and Donnelly parachuted on to the FIA gravy train. I watched the live stream of the IRL race a couple of weeks ago and there was a controversial incident in that race too. The difference in the manner in which the IRL and FIA handle such matters could hardly be more stark. Justin Wilson tried to pass Helio Castroneves in three consecutive corners and Castroneves robustly and unfairly blocked him. The race director in the IRL does not give advice he has executive power. He radioed Castroneves or his team and told him to move over and cede the position within a lap of the incident. This was after the last pit stops so this change was for the race victory. Castroneves was extremely upset after the race but at the time he respected the decision and gave up his place. I always thought that F1 was the pinnalce of motor racing although over the past 20 years it has imported many aspects of Champ car/CART/IRL racing such as pace cars, full course yellows, compulsory refuelling etc. I cannot help but think that a race director with similar powers would be a massive improvement on the current situation. By all means have the stewards as an reviewing body who act if the race director gets it clearly wrong but try and sort things out during the race. Regardless of all the arguments of who was responsible for what between the two drivers on Sunday the important part is that McLaren asked for and received a clean bill of health from the race director. Surely it would be better all round if his opinion was more than speculation and had executive effect. You are probably right about Schumacher being the first to use an outer run-off area to advantage, Steven. After all, he was the originator of many of the tricks and manoeuvres we accept as the norm these days. But tarmac run-offs have been rare until recently and so opportunities for their illegal use have also been few and far between. Now that they are becoming so common, it is obviously imperative that the FIA set down some written rules to cover such cases. I am all in favour of any system that speeds up decisions on offences during the races. The IRL method may be the way to go, as you say, but I am not so sure that I'd like to see Charlie Whiting as the man with all the power. In my book, his impartiality is suspect already. I hink that is the nub ot the whole thing Clive. The basic concept is sound but it needs to be the right guy callin the shots and the right system putting him in place. So long as Max is calling the shots we would have a problem with that system. If Charlie Whiting really did report this incident after twice telling McLaren there was no problem he should be fired but the odds are we will never find out the truth. I always thought he was one of the good guys but his lack of reaction to Nigel Stepney's letter and the subsequent letter from McLaren over Ferrari's illegal floor at Melbourne last year set off the alarm bells. How can anyone in his position receive a letter from someone who is responsible for the legality of a team's car saying that the management of the team intend to run an illegal car and not react to it? I suppose anyone who has spent all those years working closely with Bernie has to be treated as suspect. A couple of rotten apples have spoiled the entire barrel it seems, Steven. I remember at some stage during the Schumacher/Ferrari dominance a story about Ross Brawn not being shy of a tipple. And one of his favourite drinking buddies? Charlie Whiting. Do we foresee a delay in the introduction of KERS now that the forces of darkness have admitted that they are struggling with it. As ever the SECU gets thrown into the discussion. It is quite amazing that no other team has mentioned the SECU this season but Ferrari feel compelled to chuck it in at every opportunity. I wondered the same thing when I read about this, Steven. Of course, other teams have muttered about their KERS systems not being ready for next year but so far the FIA has remained silent on the matter of delaying its introduction. The fact that Ferrari are now complaining may influence the governing body but, in reality, they do not have to do anything about it - KERS is not a requirement for next year, it is just allowed. Word is that an effective and reliable KERS system will give its owner a big advantage in the races but I, personally, doubt it. The amount of power to be saved and used by the system is severely restricted by the regulations and it seems to me that the weight and extra complication will cancel out any advantage gained. It may even be that teams that ignore the option next year will have an advantage in reliability, at least. As we are going into the Monza weekend I have looked into the various different european language publications and found that the SPA "ruling" has served to greatly emotionalise as well as polarise the spectators and the public. It is thus that Bernie will gain more "eyeballs", Max will have reasserted his autocracy/authority at lardge, whilst having Ron humiliated all at the same time. Max&Bernie(-Moritz) have succeeded for the umpteenth time to manipulate the F1-Circus Maximus for their (personal) advantage and at same time in firing up a highly emotionalised (turbo)-charged rivalry among the 3 drivers and the two teams. This time round it will be much easier for everyone watching on TV, looking for the car livery rather than helmet colours, as we had to back in '88/'89, when two identical Marlboro boxes where knocking each other about. F1 is a unique fascination, not least because of it's socio-political aspects and I'm convinced that once Max&Moritz will have disappeared so will the extraordinary have vanished with them. Kajik, I have yet to hear anyone who has heard about the controversy who was inclined to start watching F1 because of it. The FIA has once again mistaken publicity for infamy. The appetite for seeing F1 stories has increased, but only to see the guilty parties (generally perceived to be the FIA, but in some places not) be hoist on their own petard. Nobody seems to have decided that it's worth watching it on TV or follow it consistently. There better be a way stronger definition of the term "track" somewhere in the regs if a law so concrete as "drivers may only use the track" is to be held in such a draconian manner. Is the "track" the ribbon of tarmac between the curbs? If so, the entire field should have served penalties, as the letter of the law does not care if advantage was gained. I've heard of moves like the "pass on the grass" of Nascar defended with terms like "Anywhere between the fence and the wall is the track," so does that mean that anything between the armco and concrete retention systems is fair game to the letter of law? Even if the call is not overturned, having it documented that Charlie lied to Ron Dennis would be interesting in and of itself, in some perverse way. I can confirm that the FIA haven't defined "track" anywhere in the Sporting Regulations, Technical Regulations or International Sporting Code. So in theory, there could be no track at all, track everywhere in the universe or anything in between, depending on interpretation. Oops! I was thinking,Are bookmakers still taking bets on the F1 WDC when there are indications of non Sporting behaviour,in any other Sport especially Horse Racing they would suspend betting and pay outs,and start an investigation. As far as I know, the bookmakers are still taking bets on the WDC, Gustofangio, but I'm not a betting man so I could be wrong. To me, it seems that the vagaries of FIA penalties are all part of the game when you decide to gamble.